Relay Creative Group did a tremendous job of collaborating with our marketing, web, and admissions staff to quickly develop this landing page and 15 online learning ads for national placement. 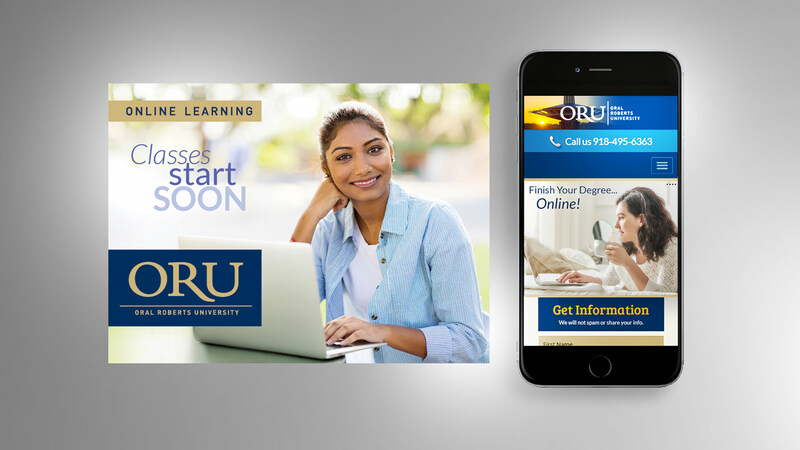 We met with marketing, web and admissions staff at Oral Roberts University for a creative brief to collaborate on a national ad campaign to reach more students for online learning. Because Relay Creative Group shares similar core values as ORU, it was easy to go to work on this creative project. First, we conducted research to understand our target market and how to reach them. Our creative was defined by the young to middle-age professional in a mostly casual environment. Colors and fonts were defined by ORU’s branding guidelines. After establishing diversity the ads and adhering to the university’s standards, we moved on to a web landing page. We created 15 ads for each of the 15 discipline areas for online learning. The landing page, with rotating ads at the top to engage a decision, was designed to acquire basic information as well as a place to define and select a discipline. An ORU battery pack with silkscreened ORU messaging made a great offering for exchanging information with potential students.